Although the finding excludes that idea, it may help to explain why evolution may favour small size on islands. The fossilised remains of a small human species Homo floresiensis, nicknamed the "Hobbit", caused a sensation when they were found in Liang Bua cave. Just over metre in height, this human relative lived on Flores before our species got there. It's thought to have gone extinct tens of thousands of years ago. While there has been considerable research - and controversy - on the subject of the Hobbit, the evolutionary origins of living pygmy people - who also typically show small stature - have not been well studied. The new analysis showed that the Flores pygmies are not significantly distinct, genetically-speaking, from other populations around the world. Like some other humans in the same region, the pygmies have inherited part of their DNA code from both Neanderthals and another type of early human, the Denisovans. The scientists also found that the modern pygmies have a high occurrence of gene variants that are associated with reduced height and plant-based diets. It was always controversial that modern-day Flores pygmies might be partly descended from Hobbits. While it may seem disappointing to find out that the genes of extinct Hobbits do not appear to live on in humans, senior author Richard Green said: "It sounds like a boring result, but it's actually quite meaningful." The associate professor at the University of California, Santa Cruz, explained: "The genetic variation that causes small stature must have been present in a common ancestor of Europeans and the Flores pygmies. The pygmies became short because of the local conditions on Flores that favour being small, and not because they are partly descended from the Hobbit species." A previous study had argued that Hobbits evolved rapidly from a taller ancestor within a few hundred thousand years. Now, Richard Green said, "if the circumstances are right, then natural selection can act on inherited variation to create a small-bodied population over a short time". If scientists do not have a reference sample of Hobbit DNA, then how can they be confident that the present-day pygmies are not descended from Hobbits? Dr Tucci explained: "We used a statistical method that is able to find traces of Neanderthals and Denisovans in the genomes of living people. Then, using the same method, we looked for other DNA read-outs that showed ancestry from long ago. None were found, indicating that it is unlikely that Hobbits contributed to the gene-pool of modern day pygmies." Prof Green said: "My colleague Professor Peter Visscher identified the gene variants that determine the short stature of pygmies - and found that they are the same ones that also occur in other modern-day humans. Together, the evidence makes it unlikely that the pygmies are in any way derived from Hobbits." 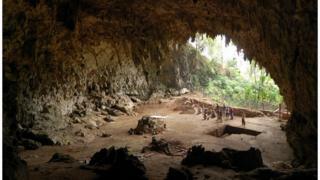 This finding also makes sense because the limited fossil evidence shows that humans and Hobbits may have lived in Flores at different times. Unfortunately, the wet and tropical conditions on Flores mean that all efforts to isolate hobbit DNA have so far failed. Dr Serena Tucci told the BBC: "Like many other scientists, it is my dream to find ancient DNA from the Hobbit. No DNA was recovered in the original Hobbit fossils, but DNA methods have improved markedly in the last few years." She went on to say: "What we need to find are well preserved fossils." That day may soon be here. Prof Green explained: "New DNA sequencing technologies were not invented to work on ancient DNA, but they might as well have been. We are hopeful that colleagues using these methods in other countries will soon be able to get Hobbit DNA from bone, or from the soil." Why are island animals often small? Understanding the circumstances that produced people with short stature on Flores may also help to explain why normally large animals tend to become small on islands. The most popular theory is that animals evolve smaller body size in circumstances where the environment or diet is poor over many generations. This may be because smaller individuals are at an advantage because of lower energy needs. This current study seems to confirm these findings. "Flores is a magical place where things go and get small," said geneticist Prof Joshua Akey at Princeton University. Dr Tucci added: "In geographically diverse and environmentally extreme regions, a gene called FADS seems to act like a 'toggle-switch' in helping animals switch to between largely animal or plant-based diets." Similar changes in FADS genes have been found in Bronze age individuals, as people increasingly began to sustain themselves on plant-based diets from farming vegetables and grains.